A week ago, Pirates starter Gerrit Cole struck out White Sox DH Adam LaRoche with a pitch whose apparent movement caused a minor sensation. The pitch was what baseball people generally refer to as a rising fastball, inevitably prompting physics people to point out that there’s no such thing. Technically, it’s a falling-less fastball, a ball thrown so hard and with such spin that it sinks less than it otherwise would. Scientific accuracy aside, the important thing is that it appeared to rise, both to LaRoche, who expected the ball to be where his bat was, and to TV viewers, who were delightfully deceived by parallax from the offset center-field camera. It takes either extreme modesty or supreme self-confidence to dismiss a pitch that looks like that as routine. Even if the camera adds 10 inches, this pitch’s movement was still special: Of all the Cole four-seamers that have led to swinging strikes — he’s accumulated close to 200 in his career — the one that fooled LaRoche put up the strongest fight against gravity, sinking only 8.9 inches on its very rapid trip to home plate. In its speed (98.4 mph), height, and movement, the pitch was most similar to a pair of four-seamers thrown by Tigers starter Justin Verlander when he was still a force to be feared. Cole is correct, though, in that LaRoche’s whiff wasn’t dramatically different from the swings that Cole’s previous fastballs have generated — for instance, this Ryan Braun cut at a four-seamer last April, when Braun was in the midst of a .318/.361/.591 month. But the sight of Cole blowing four-seamers by batters didn’t used to be routine. Two years ago, the right-hander was a completely different pitcher whose four-seamers were relatively few and far between. After arriving in the majors, Cole picked up that LaRoche-beating pitch in the first stage of his makeover. The second stage, which came this season, has fulfilled the fate that was prophesied for him as a prospect, adding him to the short list of the best pitchers in baseball. The current top 12 in FanGraphs pitcher WAR features five Cy Young Award winners (Max Scherzer, Corey Kluber, Clayton Kershaw, David Price, and Zack Greinke), a perennial contender who has yet to pitch for a playoff team (Chris Sale), a 27-year-old in his sophomore season who’s pitching almost exactly as well as he did during his award-winning 2014 rookie campaign (Jacob deGrom), and two veterans (Clay Buchholz and A.J. Burnett). And then there are the starters we’re focusing on today: three righties in their mid-twenties who’ve equaled or surpassed their previous full-season WAR totals before the 2015 halfway point. Cole, 24; Oakland’s Sonny Gray, 25; and Tampa Bay’s Chris Archer, 26, have all been above-average pitchers in the past. But for pitchers with their pedigrees, “above average” was boring. We wanted aces. We’re finally getting what we wanted. All three are pitching like full-fledged stars in their third or fourth major league seasons, posting park-adjusted ERAs roughly half of the league average with impressive peripherals to match. And they’ve done it not only by pumping GIF-able fastballs, but by riding sliders and smarts to success. Cole is the biggest, most-hyped member of the trio, a former two-time first-round draftee turned top-10 prospect with a prototypical power pitcher’s build. His MLB-best 11 wins and his 2.16 ERA warm an old-school-stat-lover’s heart, and both his 2.73 FIP (down half a run relative to last season) and his career-best 19.9 percent K-BB percentage reveal real strides. Despite his heat — Cole’s near-97 mph average four-seamer ranks fifth among starters this season — the righty didn’t miss bats immediately. In Triple-A, Cole struck out only 18 percent of the hitters he faced, upping that rate to a still-modest (by modern standards) 21 percent in his first big league season. 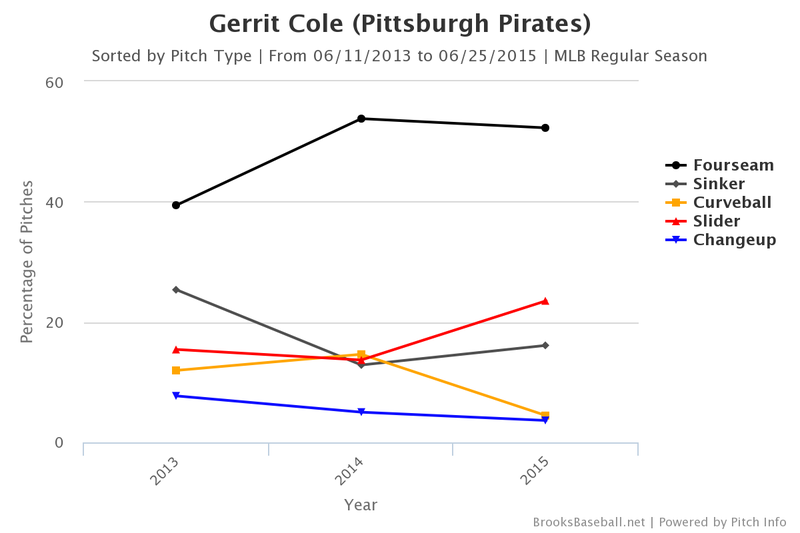 Coupled with a low walk rate, a high ground ball rate, and the Pirates’ aggressive infield defense, Cole’s passable strikeout rate was enough to make him an above-average major league starter. But it took two major alterations to Cole’s arsenal to make him something more. The first stage of Cole’s metamorphosis, which started during his rookie year, was an exchange of the sinker — the Pirates’ preferred pitch — for the four-seamer, which generally leads to a lower ground ball rate but also less contact. The result was a significant uptick in Cole’s strikeout rate last season with no corresponding decline in ground ball rate, thanks to his tendency to stay low in the zone and get grounders with all of his offerings. This year has been distinguished by heavier usage of Cole’s slider, which was rated as one of the best in the minors (behind Archer’s) when he was a prospect. Leaguewide, the slider is the least contact-prone pitch, yielding the highest average whiff/swing percentage of any offering. Last season, Cole threw more curves than sliders, but this year he’s nearly shelved the former pitch in favor of the latter — seemingly a smart decision, since his curve has gotten far fewer whiffs and grounders from 2014 to 2015. “I’ve just been able to locate better this year, so we’ve found more opportunities to try and throw [the slider] inside [to lefties] to maybe get a strikeout or finish the at-bat off,” Cole says. Or, alternatively, to throw it outside to righties and make Buster Posey talk to himself. Theoretically, a reliance on the slider should make Cole more vulnerable to opposite-handed hitters, since sliders produce larger platoon splits than curves. To this point, though, Cole has actually been better against left-handed hitters, who hit him fairly hard last season. As Cole has gone to the slider more often, he’s established a more regular presence outside the strike zone, reducing his zone rate from 50.3 percent in each of his first two seasons to 47.2 percent this year. Cole’s willingness to loosen the strike-zone-centric approach he employed in the past has been a byproduct of both mental and physical maturation. Cole’s sense of his own evolution is backed up by the stats, which show decreased variation in his horizontal and vertical release points, as measured by standard deviation in inches. Compared to last season, Cole’s individual release points are more closely clustered around his average release point, like darts forming a tighter ring around a bull’s-eye. Here’s a look at his standard deviation stats before his most recent start. Release-point variation is weakly correlated with unintentional walk rate, which means that pitchers with tighter release points tend to allow fewer free passes. One would expect the same to be true of command, the ability to place a pitch in a certain spot inside or outside of the strike zone. Cole’s greater control over where his pitches leave his hand has given him greater control over where they cross home plate. There’s still some untapped potential in the Pirates’ most dominant arm. Cole’s curve and changeup have been afterthoughts this year, which isn’t a problem for a pitcher with three other pitches that work so well. But if he does develop a craving for variety, he won’t have to start from scratch. Only Max Scherzer’s ascension to a higher pitching plane has prevented Archer from being the best pitcher in baseball in 2015. 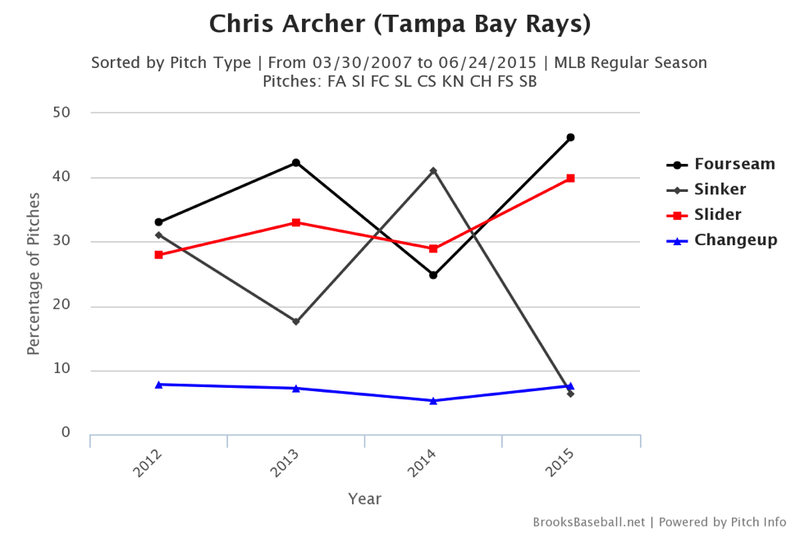 Archer has leveled up every aspect of his performance, raising his strikeout rate and ground ball rate while lowering his walk rate. The 2015 AL strikeout leader’s K-BB percentage is exactly double what it was last year and by far the biggest percentage-point improvement of any regular starter from both seasons. Better yet, he’s shown no platoon split, manhandling all opponents equally. Archer has made the same two changes Cole has incorporated: swapping sinkers for four-seamers and making his slider more of a staple pitch. He’s just making both tweaks at the same time instead of rolling out the changes over multiple seasons. Archer’s four-seamer, whose roughly 96 mph average speed slots in between Cole’s (97) and Gray’s (95), is a weapon on its own, an above-average bat-misser that got just as many grounders as his sinker (which he throws at close to the same speed) last season. But the slider is the main event, a string-pulling pitch that even this season’s best hitter swung through. The salient fact about Archer’s slider isn’t just that he’s throwing it more often this season; he’s also throwing it much harder, for the third consecutive year. All of Archer’s pitches have added speed since he broke into the big leagues, but the slider is really running on nitrous. With each speed boost, the pitch becomes a bigger headache for hitters. In Archer’s rookie season, his slider was roughly league average in its ability to generate grounders and swings. Now, it’s a full 4 mph faster, one standard deviation above the MLB mean in whiff/swing rate and almost double that in ground balls per ball in play. 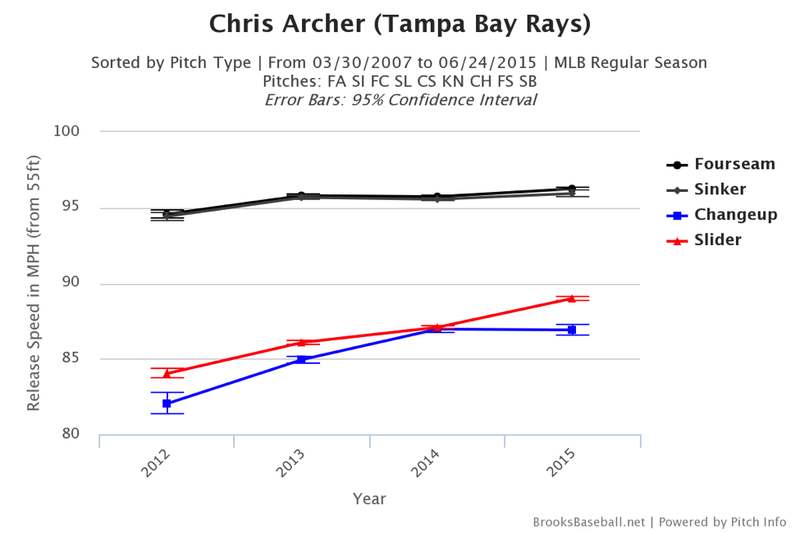 Even within this season, Archer’s slider speed and rate have continued to climb, as his opponents’ poor results have provided positive reinforcement. If you had Archer’s slider, you’d throw it more often, too. And so would Price, who declared it the best pitch in baseball earlier this year. Archer’s zone rate, unlike Cole’s, has actually risen, both because of the extra four-seamers and because his slider is easier than Cole’s to throw for strikes. The latest uptick in velocity hasn’t detracted from the slider’s side-to-side movement, but the pitch has shed some of its vertical movement, making it a pitch he can control and deploy in any count. Last season, Archer threw the slider more often when he was ahead in the count. This year, he’s thrown it more often when he’s behind in the count, even though it still has a frequent presence on two strikes. Archer’s slider is always a threat. As Archer attempts to solidify his early lead in the AL Cy Young race and the Rays try to cling to a slim lead in the AL East, we’ll see where the slider’s velocity limit lies — so far, he’s maxed out at 93 — and how long Archer’s arm can continue to handle the increased strain. It’s not reassuring that the three starters who’ve thrown their sliders harder than Archer this season (Jake Arrieta, deGrom, and Matt Harvey) have surgical scars on their elbows, although that’s anecdotal evidence. Better research suggests that sliders aren’t as dangerous as is typically believed, but that ever-climbing velocity line should make us wonder whether Icarus is Archer’s closest comp. Of the three starters in the spotlight, Gray has probably benefited the most from batted-ball effects beyond his control, posting the lowest BABIP and HR/FB rate of the bunch (partially thanks to O.Co Coliseum’s deep fences and sprawling foul territory). That extra assistance from the ballpark and the baseball gods has helped him allow the AL’s second-lowest WHIP, sandwiched between Sale’s and Archer’s, even though he doesn’t have either of those starters’ strikeout stuff. Like Cole, Gray throws his slider around 87, but it’s more of a sweeper than Archer’s or Cole’s, with a few extra inches of horizontal movement. You’re used to this story by now, but here’s the graph of Gray’s pitch-type percentages. Gray’s four-seamer use is up slightly this season, but it’s down from 2013, when he threw it almost half the time. Unlike Cole and Archer, he relies more on the sinker today than he did when he debuted, although his ground ball rate has remained fairly steady across his three seasons. The common thread is the replacement of curves with sliders. Gray’s 12-to-6 curveball was his signature pitch as a rookie and remained by far his most common off-speed pitch last season, but he was tinkering with a variant of the breaking ball even in 2013, which gradually became less of a slurve and more of a distinct slider. The overlaid image that Owen Watson made last summer illustrates the difference well. It’s easy to see why Gray has reversed the curve’s and slider’s spots in his breaking-ball hierarchy: He’s getting whiffs on 26.8 percent of his sliders, the highest rate among starters, and almost double his curve’s highest rate in a season. As a result, his overall strikeout rate is up, and the extra chases on pitches that might once have been balls have helped his walk rate hit a career low. In addition, 20 percent of the balls put in play against Gray’s slider this year have been popups, the second-highest rate among 158 pitchers who’ve thrown at least 100 sliders. That helps explain the low BABIP, although it won’t necessarily be one of the pitch’s permanent traits. In 2008, the first PITCHf/x season, 9.0 percent of pitches were curveballs, according to Pitch Info’s classifications. This season, the percentage is 8.8 — essentially unchanged. Sliders, meanwhile, have picked up 1.3 percentage points, and they haven’t come at the curveball’s expense. If Cole’s and Gray’s decisions to swap curves for sliders are part of a leaguewide trend, it’s one they’re starting, not one they’re picking up from others. But the great results they’ve gotten by switching primary breaking balls might inspire other power pitchers who can bend it both ways to reexamine their repertoires. Most pitchers’ fastballs peak as soon as we see them and taper off from there, as wear and tear saps elasticity from their arms, slowly eating away at radar-gun readings even in the absence of an obvious injury. But just as aging position players make up for slowing bat speed by becoming more selective, pitchers compensate for slowing pitch speed with more movement and refined command, propping up their walk and ground ball rates deep into their twenties. Cole, Archer, and Gray are still in the sweet spot, an ephemeral period when velocity plateaus and a pitcher’s best fastball overlaps with the lessons that have made him smarter about using his stuff. Inexorably — either a tenth of a mile per hour at a time or all at once with one torn piece of tissue — attrition will turn those 97s, 96s, and 95s into 94s, 93s, and 92s, forcing further, increasingly ineffective adaptations. For now, though, we’re watching three aces whose arms are still unspoiled and whose brains get better by the day.